It’s a solution to different systems focusing economical, technical, and constructive question. Many different material and system such as composite, PVC, etc. had been developed as an alternative to the galvanized sheet metal used traditionally. Pre-Insulated Duct is the solution. It is a sandwich panel composed of a layer base from good fire retardant rigid polyurethane foam covering both sides with aluminum foil. The aluminium guarantees sturdiness and withstand corrosion in long term use. Polyurethane pre-insulated duct has been developed and spread around the world. Its application has been gradually extended to all type of air distribution system such as industrial, commercial and civil. DUCT FABRICATION PROCEDURE FOR THE PRE-INSULATED "PIR PANEL"
Panel is cut by special cutting tools. Adhesive is applied between the gaps of panel. 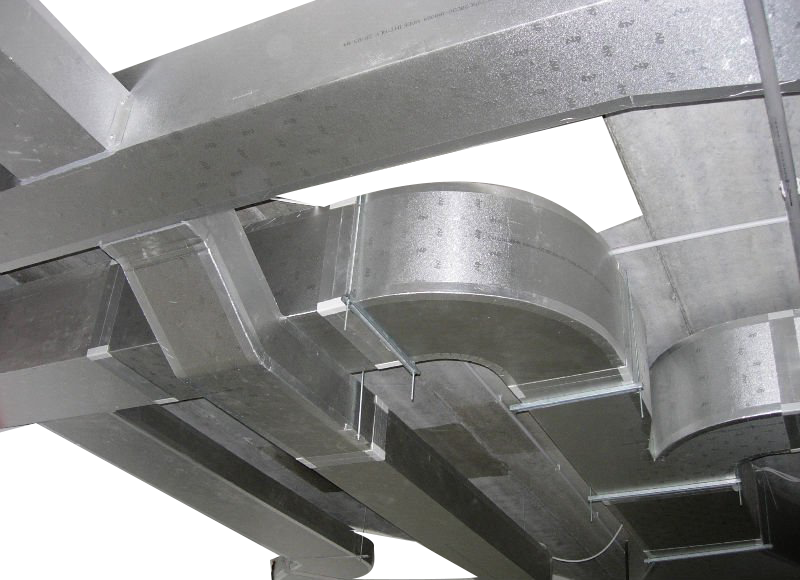 The Duct is carefully bending by special bending equipment. Panel is folded to form of duct. Aluminum tape is used to cover joints. Sealant is applied at folding connection. Flange is installed to the end of duct. Two seperate ducts are jointed together. A section of ducts complete and ready to be installed.